No era of design in memorable history is more iconic than mid-century modern. This movement was all-encompassing, from architecture, interiors, product design, fashion, and even graphic design. The mid-century modern revolution changed the way people understood all aspects of development and invention. Radical in its ability to alter our perceptions about form and function, mid-century modern design was subversive in consenting the new wave of defiant designers and avant-garde architects. Beginning in the 30s, and proceeding until the late 60s, this influential movement had a far-reaching effect on interior design and the way we identify with our domestic spaces. These days when we think of mid-century modernity we visualise designers such as Eames, Saarinen, Bertoia and Jacobsen, each imparting their individuality and distinct style. Often this era of design focuses on dining and living rooms, but today we are taking a look at some mid-century-modern-esque sleeping quarters that are a little different. They combine style with practicality, along with some contemporary twists and inventive adaptations. 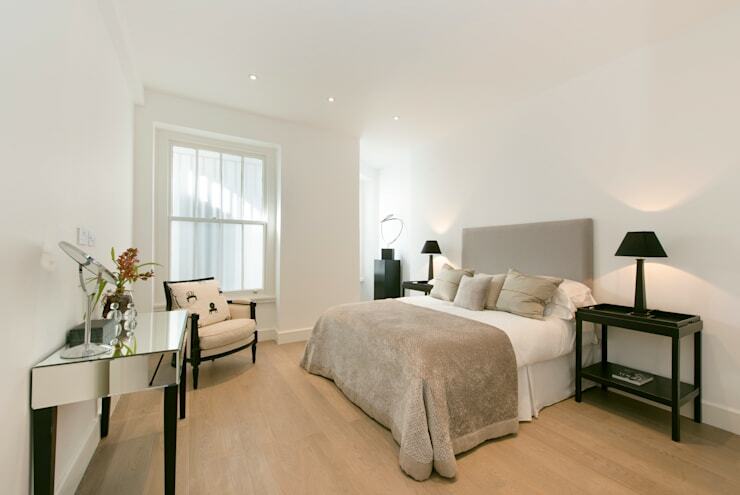 Let homify offer a little inspiration for you to update, renew, and revive your bedroom today. This bedroom takes elements of mid-century modern design and imparts a sense of elegance and lavishness into the space. From the contrasting side tables to the mirrored dresser, this room is elegantly opulent, with the cool charisma of mid-century design aesthetics. When designing or planning a mid-century bedroom, it is important to consider the furniture that will be used in the space. 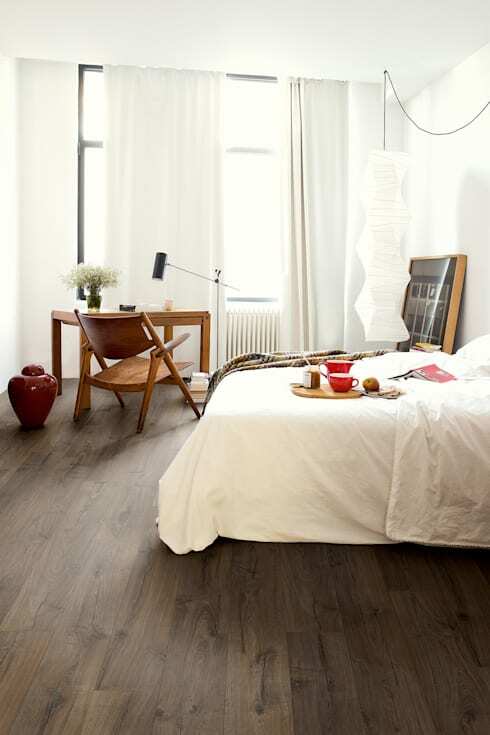 The key to creating a stylish mid-century modern bedroom is to keep it simple. Often pieces of furniture from this era are expressive, they add a great deal of vivacity and style to a space, and therefore can be used in moderation. This example shows how two pieces, a dresser and stool, can exude character and easily provide charisma within a space. Would you like a bedroom that is classic, but with a little mid-century panache and style? 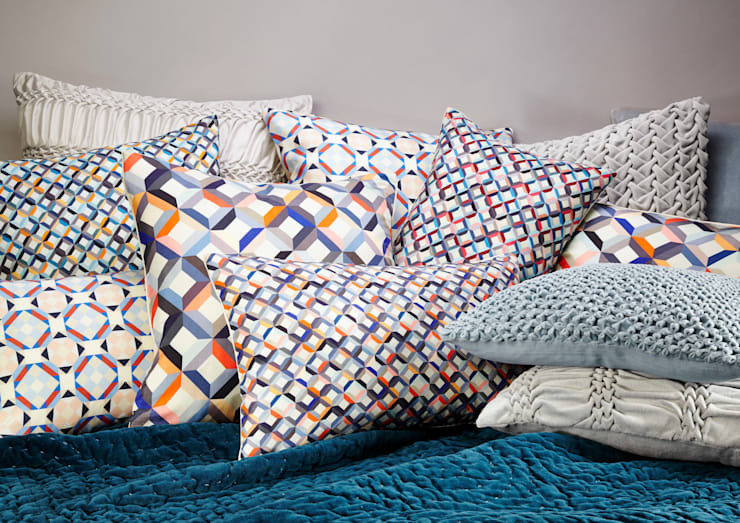 Try accessorising smartly with some throw cushions in a retro geometric print. Brighten your space with some stylish pillows that will undoubtedly add flamboyance, flair and vivacity to any space. 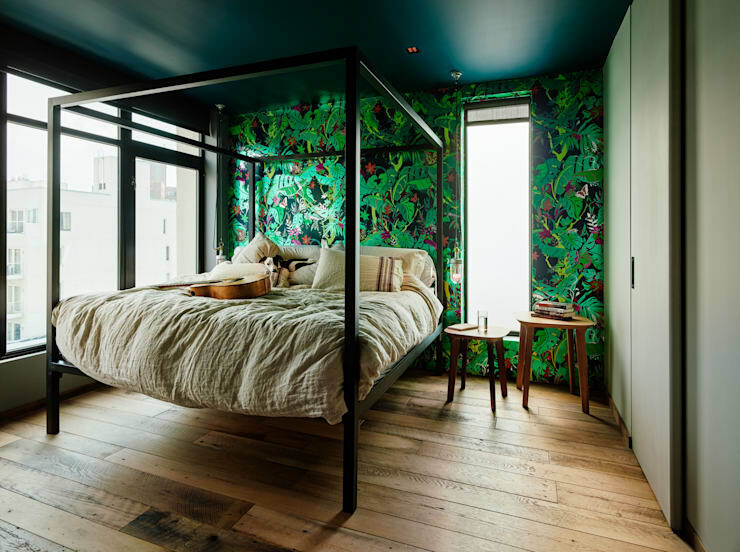 This bedroom combines several styles to ensure the vibe is vivacious and energetic. More often than not, we see ceilings painted white, but in this case the ceiling is a deep dark aqua hue, with a coordinating botanic themes wallpaper. Paired with this wild colour scheme are neutral robes, natural timber floorboards and comfortable textiles. To top off this space, the four poster bed is oversized, luxurious and matches the mid-century side tables adjacent. Show your design nous, and impart a little style and flair into your space with a suspended light and mid-century desk and chair. This bedroom is light, bright and airy—from the all-white bed linen, to the floor-standing red vase, this space oozes intellect and decorative aptitude. To emulate this design, choose luxurious, oversized bed linen, white walls, white floor-to-ceiling curtains, and satin timber floorboards. Moreover, emphasise the room’s style by incorporating a timber feature. The mid-century desk and chair are minimal but suit the bedroom space easily and effortlessly. 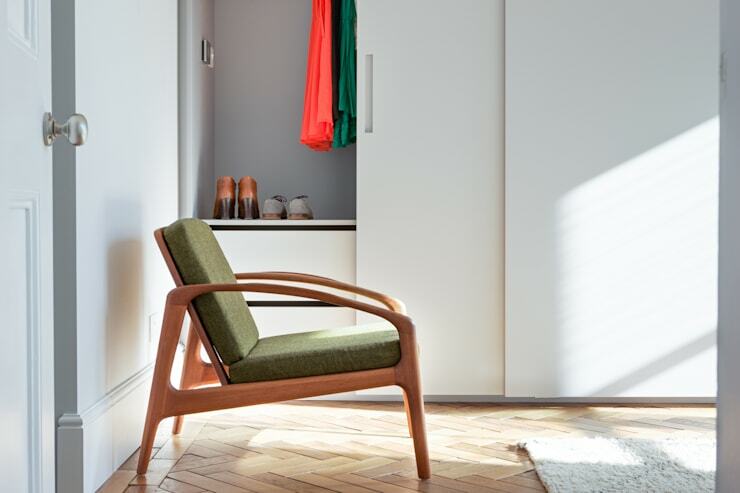 This statement chair is a perfect example of mid-century furniture being utilised within a contemporary residence. From this view we can see the contemporary built-in wardrobe which is in contrast with the traditional architecture of the home. 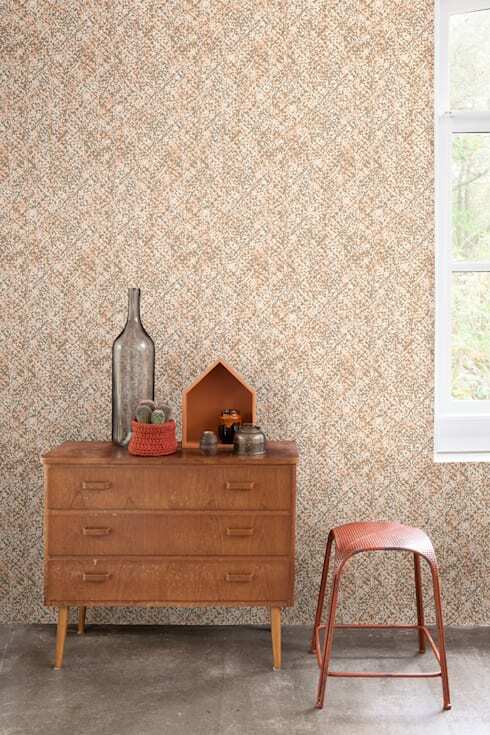 The herringbone flooring imparts and element of rustic charm which is contrasted perfectly by the 50s style chair, and again by the modern robe. If you are thinking of introducing some mid-century style into your bedroom, think about an armchair. It will provide a space to read, think, meditate and rest, while injecting an air of glamour and panache into the space.